If you’re looking for what to eat in Budapest, you’ve come to the right place. We spent a month in this beautiful city, exploring the markets, ruin bars, and of course, restaurants and food stalls. The city’s Hungarian cuisine gave us an introduction to a number of new delights, in addition to the tried-and-true foods you would expect (but maybe didn’t know came from Hungary). Budapest is the capital of Hungary and the tenth largest city in the European Union. It is known for its distinct architecture, and the River Danube that divides the city in two, and for its delicious food. If you’re visiting Budapest, you should see some of its historical sites. Some not-to-be-missed sites in Budapest include the 13th-century Buda Castle, which is now home to some of the best Hungarian art, Matthias Church in Trinity Square, and the Chain Bridge, which links the two sides of the city together. It’s also critical to check out some of the city’s famous Ruin Bars. These funky establishments are working pubs, restaurants, and bars that are literally erected inside the ruins of derelict buildings. The decorations are usually eclectic, made up of random bric a brac that looks like it was pulled from a trash heap (which it often was). Some Ruin Bars have a consistent theme, while others look like they were put together by an artist descending into madness. In other words, they’re a lot of fun! Some may also be surprised that Budapest is also known as the spa capital of the world. Here you can find a number of hot spring spas with many in and outdoor pools within which to soak the day away. Of course, you should also taste the local cuisine to get to know the city more intimately through its food. 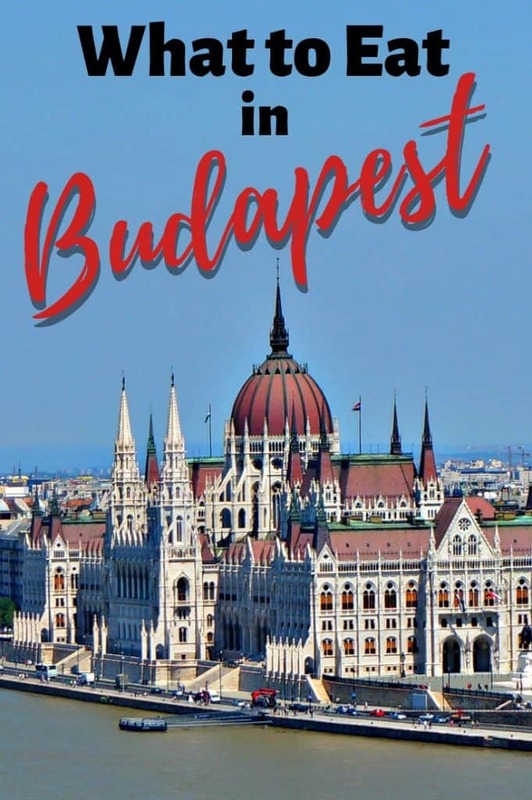 This food guide to Budapest gives you a list of delicious Hungarian dishes, desserts, and snacks that you should try while visiting this intriguing and beautiful place. It is impossible to describe Hungarian Cuisine without a brief discussion about the nations favorite spice, Paprika. The type of this beautiful red spice goes far beyond that used to give a little finishing touch to hard-boiled eggs. At its most basic, paprika is made from ground peppers. The type of pepper used (and the technique used to produce it) will have a major difference in the taste. Sweet paprika is made from dried sweet red bell peppers. Smoked paprika is dried and smoked over an oak fire. Either sweet or hot chilis can be used, resulting in a very different flavor. It isn’t recommended us substitute smoked for sweet paprika in recipes for this reason. Hot paprika is made with spicy dried chilis, sometimes including some of their fiery seeds for more heat. The level of spiciness is similar to that of red cayenne pepper, without reaching the same intensity of heat. Goulash (or gulyás in Hungarian) is Hungary’s national dish. 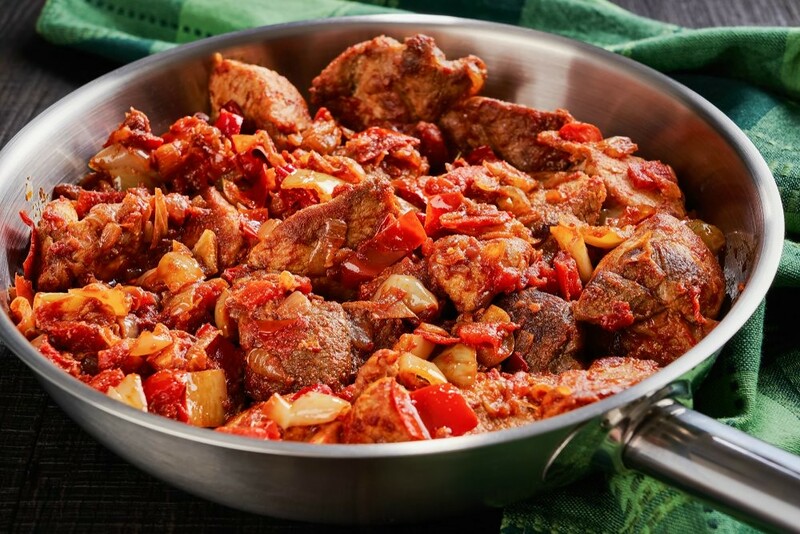 It’s a rustic stew that is made of meat and vegetables and seasoned with Hungarians’ favorite spice, paprika. It is commonly made with beef, but other variations of the dish feature veal, lamb, or pork. Even though you can’t make the dish now without adding paprika, did you know that the spice wasn’t actually introduced to Hungary until the 18th century? 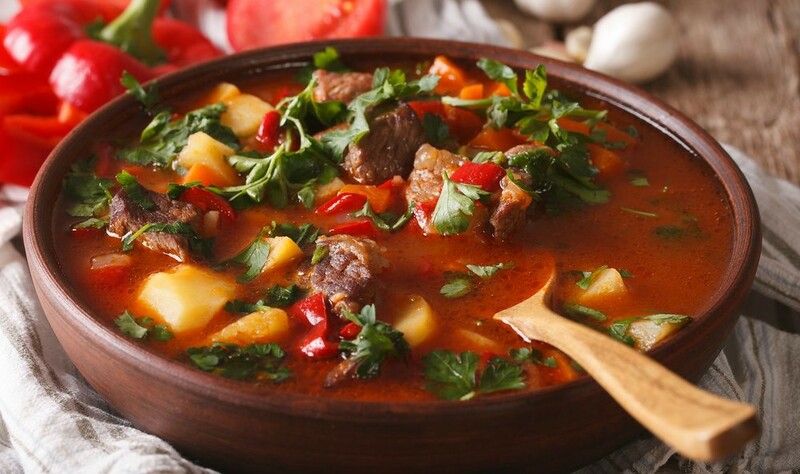 Historically, during the 9th century when the dish was invented, gulyás, which means herdsmen or shepherds in Hungarian, would simply be boiled meat and vegetables in water. Tomatoes were added much later than paprika as the dish continued to evolve through the centuries. 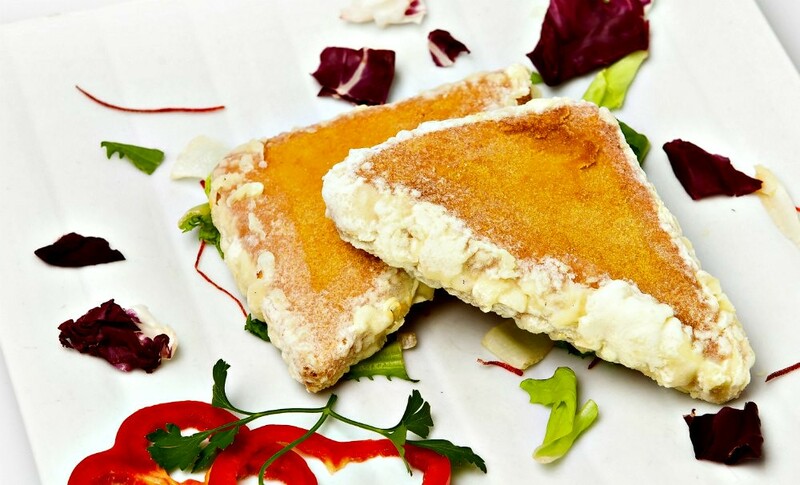 Lángos is a type of Hungarian bread that is deep-fried and served with different toppings. The texture of this popular savory snack is like a hybrid between an American donut and an Italian pizza. 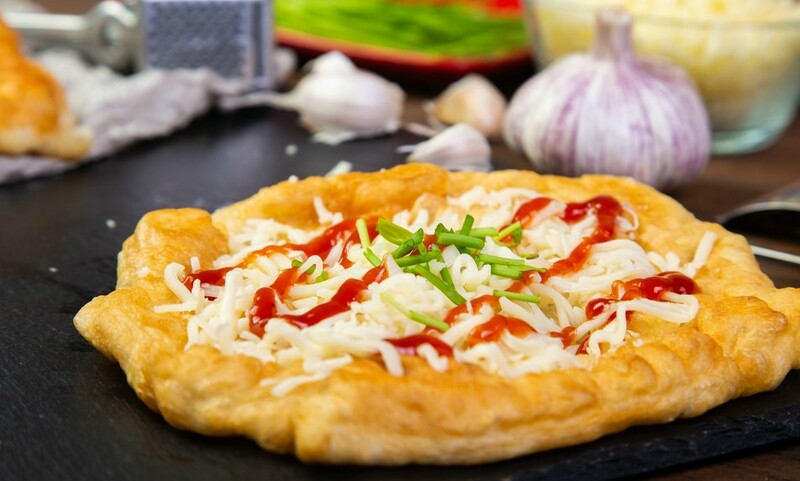 The most popular toppings on a lángos are sour cream and grated cheese, but you can also find variations with toppings including garlic, sausages, ham, mushrooms or simple garlic water sprinkled liberally on the fried bread. It is a popular street food in Budapest and is the perfect snack to on during a crawl through Budapest’s famous pubs and ruin bars. Kürtőskalács is another doughy Hungarian street food that, unlike the savory lángos, is sweet due to a generous sprinkling of sugar and cinnamon. It got its nickname, the chimney cake, from its shape. Kürtőskalács is made from dough that is rolled until thin and then cut into strips. Each strip is then wrapped a thick wooden tool with metal handles that serves as a skewer while the dough is being cooked over fire. When you remove the tool, the cake takes a cylindrical chimney-like shape with a hollow center. It is rolled in cinnamon sugar and sometimes sprinkled with ground walnuts before being served. Kürtőskalács are another perfect treat to enjoy while walking around Budapest and taking in the sites. Töltött káposzta is Hungary’s version of a spring roll. But instead of rice paper, they use cooked cabbages as a wrapper for the filling. This dish isn’t unique to Hungary. Several countries around the world, like South Korea, China, Azerbaijan, Poland, Ukraine, Russia, Croatia, Egypt, and the United States, have their own versions of the dish. In Hungary, töltött káposzta is made with minced pork mixed with sauerkraut, rice, and eggs and is seasoned with different spices including, of course, paprika. Hungarians also add their own special touch by drizzling a little sour cream on top. 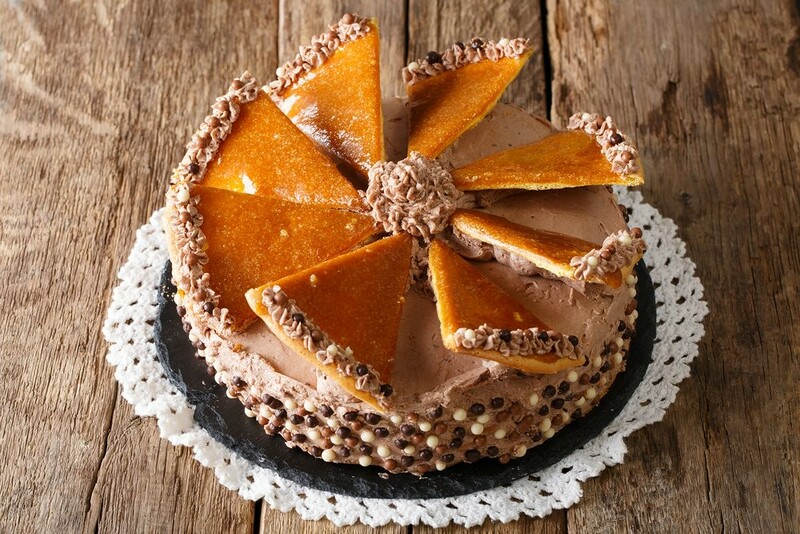 Dobos torta (also known as Dobos torte, Dobosh, drumstick cake, or drummer cake) is a Hungarian dessert that is made with layers of sponge cake and chocolate buttercream. The delectable dessert is elevated to perfection by a layer of caramel on top. Dobos torta was named after the chef who invented it, József C. Dobos, who presented the cake at the 1885 National Exhibition in Budapest. Decades later and the confection is still relevant and popular in Hungarian cuisine, and well worth tracking down to enjoy with a cup of Hungary’s national drink, coffee. 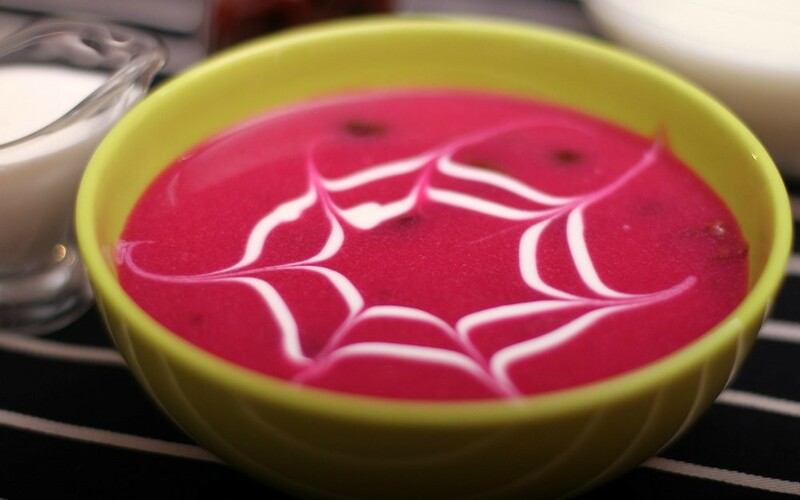 Gyümölcsleves is a cold fruit soup that mostly resembles an açai bowl. But, unlike the trendy açai bowl, this Hungarian dish is cooked before it is placed in the refrigerator to chill. Typically, a bowl of gyümölcsleves is made with frozen cherries and berries, apple chunks, a cinnamon stick, sugar, milk, flour (as a thickener), and salt (to taste). Other variations include more tropical fruits and citruses. Gyümölcsleves is the perfect light and refreshing Hungarian dish to try if you’re visiting Budapest during the summer. 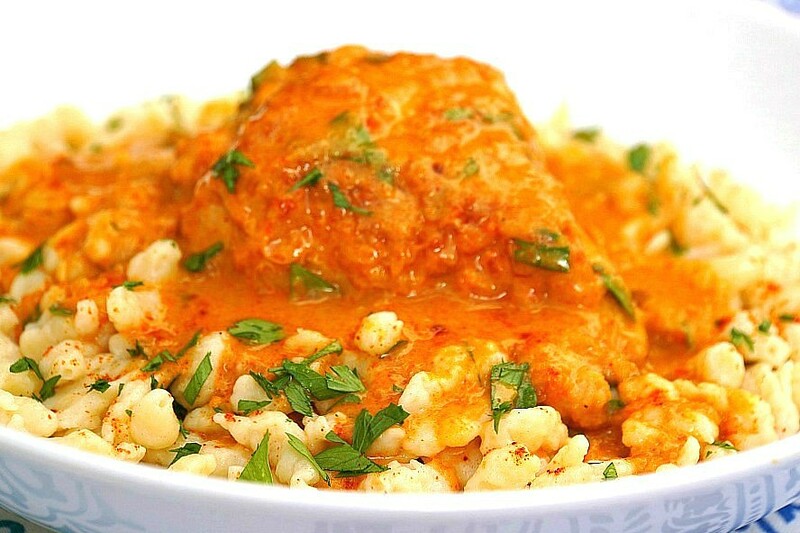 Chicken paprikash (alternatively, chicken paprikas or paprika chicken) is a traditional Hungarian dish the makes liberal use of the most common spice in Hungarian cuisine, paprika. As you’d guess, the dish also relies on a fair amount of sour cream that results in a full flavored rich and creamy sauce that comes together in a dish that is comfort food at its best. This dish was invented in the southern parts of Hungary and was intended to use up older chickens that were past their primes, which means they had tougher meat. Today, however, chicken paprikash is made with softer parts from younger birds. The chicken and sauce are most often placed on top of handmade egg noodles, nokedli or spaetzle and served with a spicy hot paprika sauce, eros pista, for an added kick of spice. 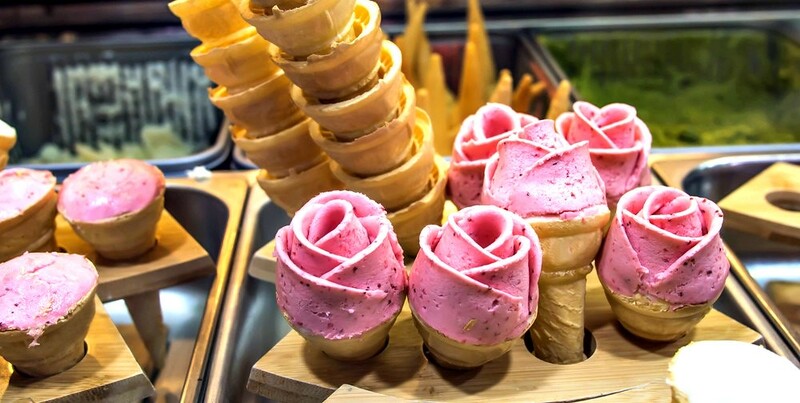 In Hungary, Gelarto Rosa is a popular ice cream parlor known for its delicate rose-shaped gelato. Both locals and tourists love to go here because of their cute and delicious ice cream cones. Like gyümölcsleves, Gelarto Rosa’s rose-shaped gelato is a great summer food to try in Budapest. They serve different flavors and also have vegan-friendly options. The store is just a short walking distance away from St. Stephen’s Basilica. Palinka is not actually a food but it is still a popular product that originated in Hungary. It is a type of fruit brandy that is made from different fruits grown on the Great Hungarian Plain, which is part of the Carpathian Basin. Palinka’s common fruit flavors include apricot, cherry, pear, and plum. Most restaurants in Budapest will offer you a shot as a digestive to finish out your meal. The flavor, and alcohol content, is pretty strong and a perfectly fitting end for filling Hungarian fare. Egészségedre! 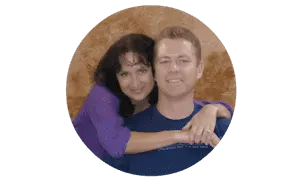 – To your health! Palacsinta (also known as palatschinke or clătită) is the Hungarian cousin of the French crepe. Historians believe that the dish actually originated from Romania, but it is now a common food found in central and eastern European countries. 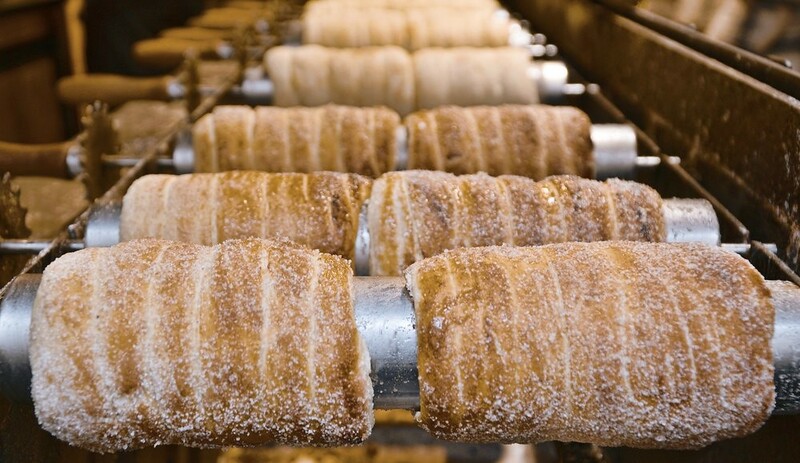 In Hungary, palacsinta’s batter is made with eggs, flour, milk, sugar, salt, and carbonated water. It is filled with a variety of fruits and different spreads, like chocolate, peanut butter, and almond butter. Not into sweets? 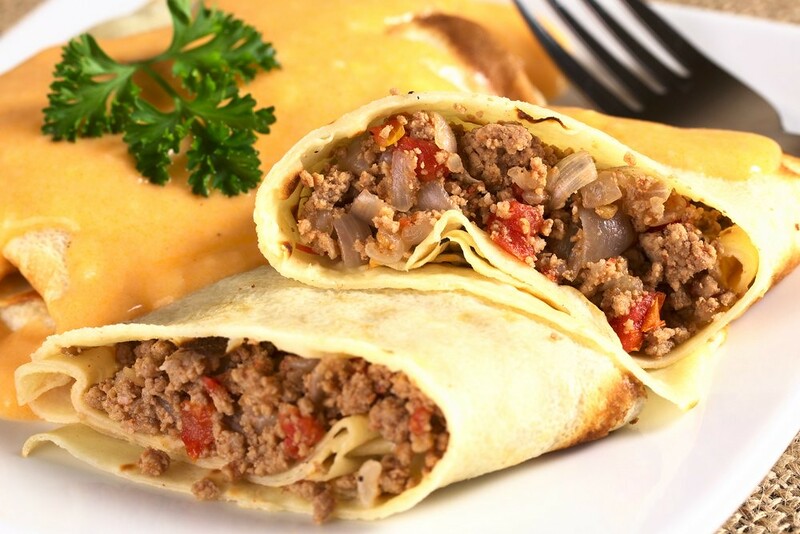 There are also savory varieties with fillings such as scrambled eggs, seafood, mushrooms, and creamed meats. 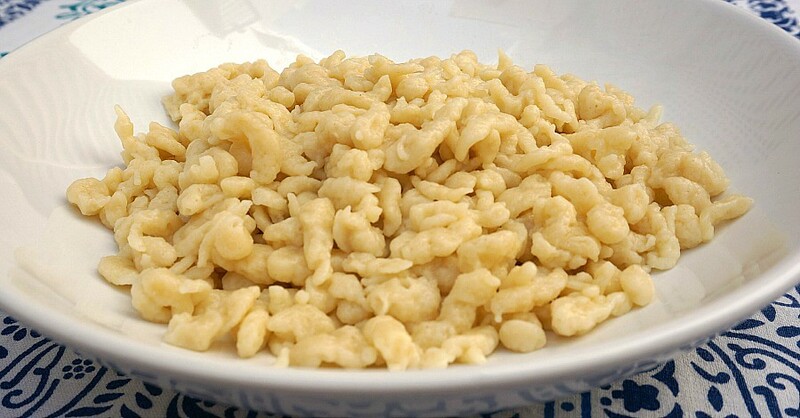 Nokedli is a pasta dish with a controversial history. Several countries in Europe claim to be its geographic origin. Aside from Hungary, Switzerland, Germany, and Austria are just some of the countries that claim to invent this simple but delicious dish. Nokedli are simple handmade noodles made fresh with eggs, water, flour, and salt. They are drizzled over boiling water by either pushing the dough through as slotted sieve (nokedli maker) or even allowing droplets of dough shower into the pot from your fingertips. The pasta is then usually tossed in butter and seasoned with salt and pepper. Some take the added step of toasting them in a hot pan until they are golden brown. Simple and delicious. Do you like cheese? Are mozzarella sticks one of your top comfort foods? 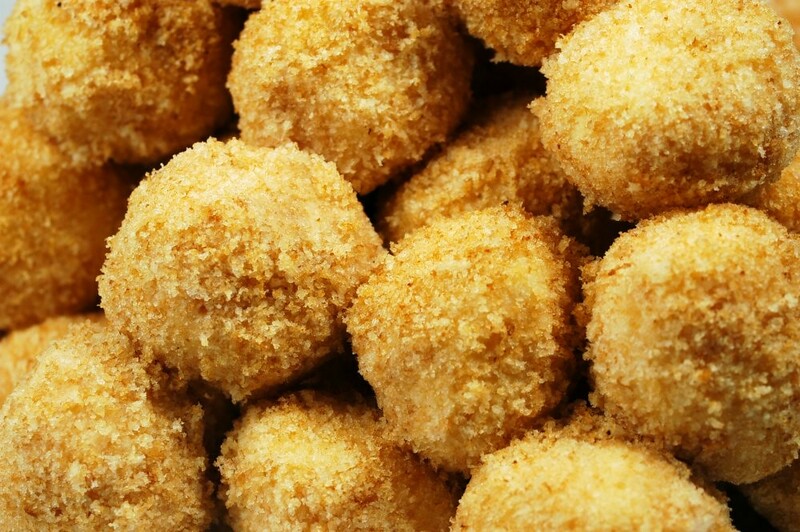 If you answered yes to both questions, then you’ll definitely like rántott sajt, a deep-fried dish made from a flat block of cheese coated in breadcrumbs. It is typically served with a side of rice or fries. Although rántott sajt is a popular Hungarian dish, its roots may have come from Romania. No matter where the dish originated, it matters most where it can be found and perfected with local ingredients. In the case of rántott sajt, Hungarians have done just that. For all those with a sweet tooth out there, Budapest has you covered. Make sure to stop by Rózsavölgyi Csokoládé. This Budapest-based Hungarian chocolatier uses traditional processes, pure ingredients, and cocoa beans from Venezuela and Madagascar to create their bonbons, truffles, and other chocolate products. 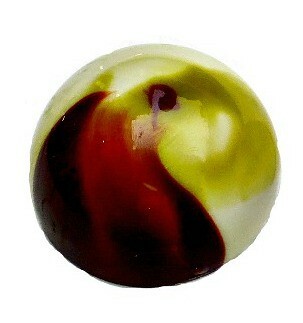 One of their unique and specialty items is the unusual Tarragon Chocolate Truffle. While not often used in sweet dishes, the mild flavor pairs perfectly and is a must-try during a visit to Budapest. Fisherman’s soup, or Halászlé in Hungarian, is a warm, spicy soup that is made from carp or a mixture of river fish. It has a distinct red color that comes from the generous amounts of hot paprika. The broth is made with a variety of vegetables like onions, green peppers, and tomatoes. If you’re visiting Budapest during the colder months of the year, fisherman’s soup should be one of the dishes that you try. Be warned, though, as this dish is not for the faint-hearted. If your heat tolerance is low, keep a glass of water or milk waiting at the table. Lecsó is a tomato-pepper soup from Hungary that has many versatile uses in Hungarian cuisine. It can be served as an appetizer, main dish, or used as a base for other dishes like goulash and other meat stews. 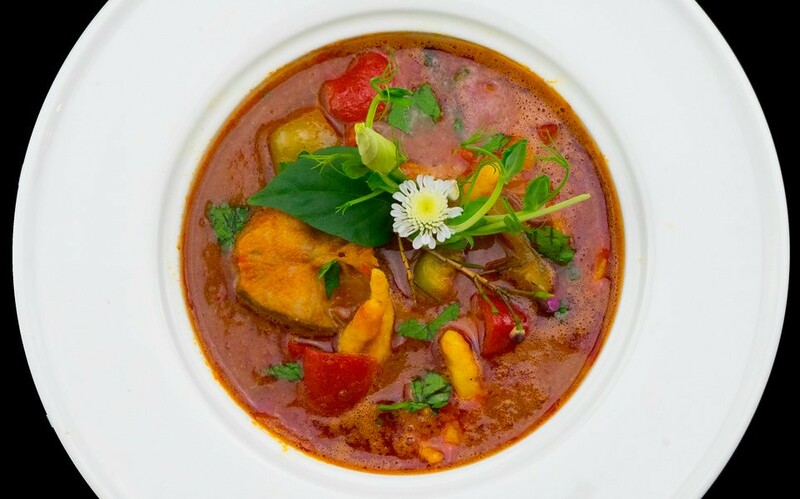 Lecsó is often compared to the French dish ratatouille, so if you’ve tried that before, you’ll have an idea of what it tastes like. Other countries in the European Union also have their versions of lecsó. For instance, Germany has letscho, while Poland has leczo. A stew made with kidney beans, meat, and paprika, sólet is a traditional Hungarian-Jewish dish that is often served every Friday, the day before Shabbat or the day of rest. 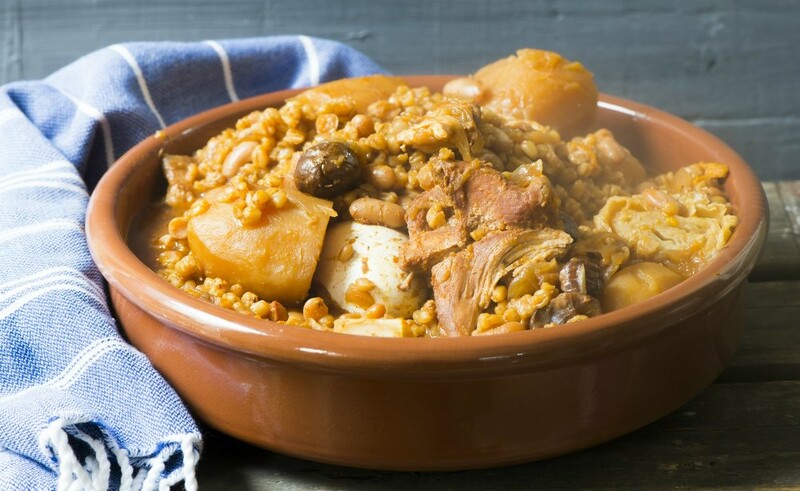 It is similar to another Jewish dish called cholent, but many believe that sólet was invented first. For a more filling variation of the dish, you can have a halved boiled egg served with sólet. The kind of meat used in the dish varies, depending on the season. By now, you would have noticed that Hungarians like their soups and stews. One of their favorite soup dishes is potato and sausage soup, which is pretty straightforward given its name. 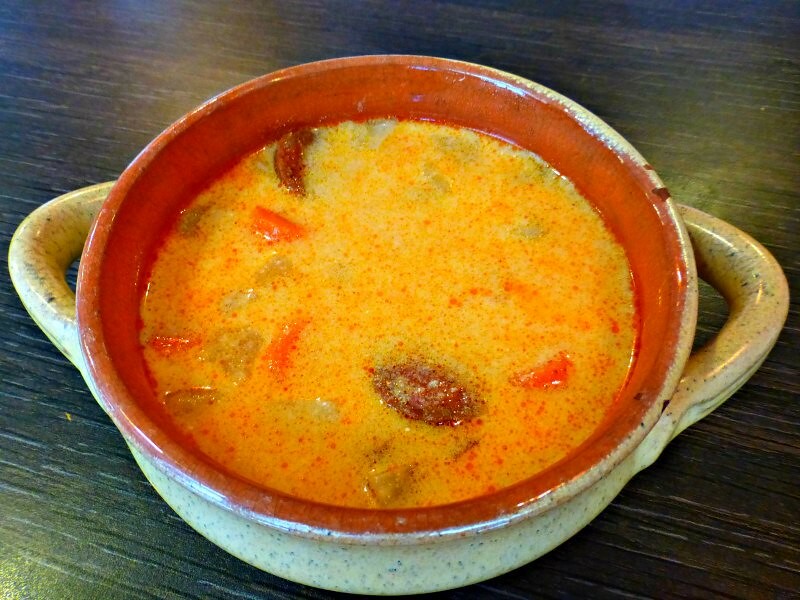 It is made with potatoes, Hungarian sausages, paprika, spices, sour cream, and stock. You should try this dish when you visit Budapest, but it is also an easy dish to create at home. If you don’t have Hungarian sausages, you can replace them with Polish kielbasa or Spanish chorizo. We love it with a nice thick crusty bread for sopping up the broth. Somlói galuska is commonly known as Hungarian sponge cake, but it actually more closely resembles a trifle. 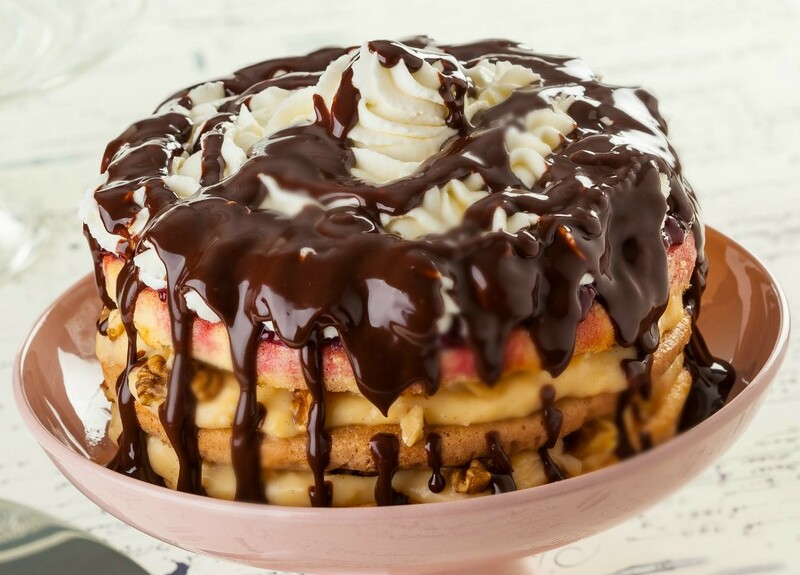 Made with layers of sponge cake, whipped cream, and chocolate sauce, this delicious and delectable dessert was invented by Károly Gollerits at the end of the 1950s. When in Budapest, somlói galuska should be one of the first desserts that you try. 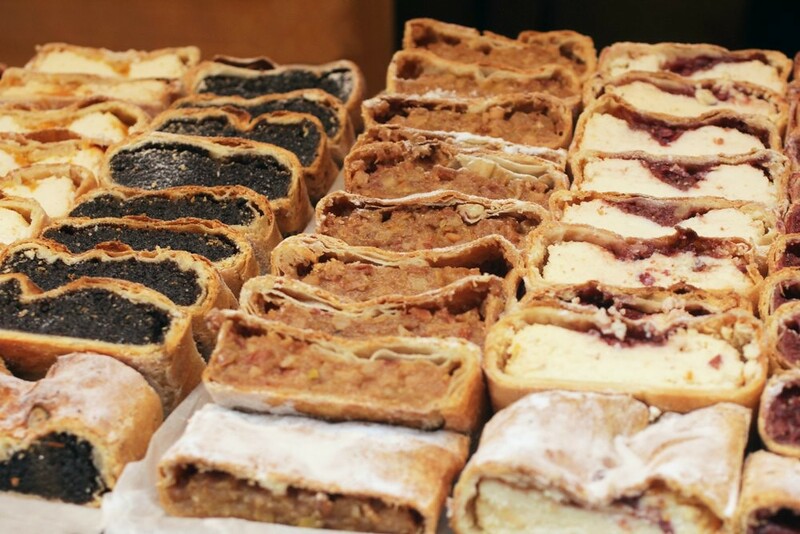 You may find similar desserts practically anywhere else in the world, but they won’t taste as good as the Hungarian version, or so we predict! Fröccs is a popular summer drink in Hungary. 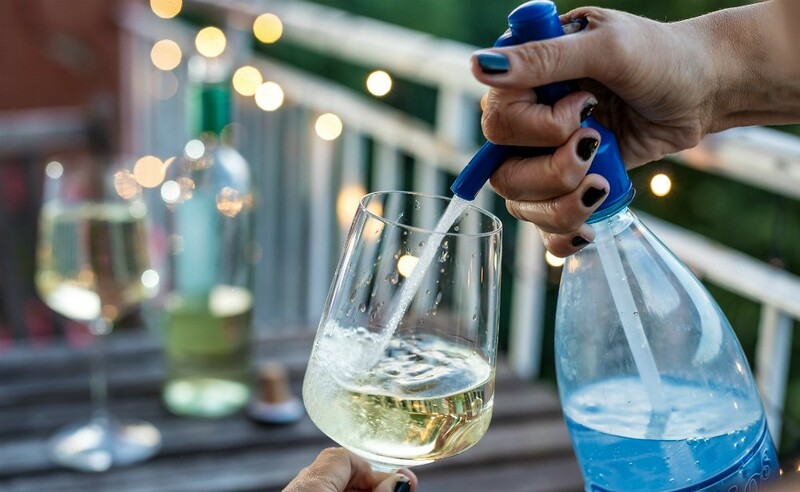 In English, “fröccs” translates to “spritzer” and it is exactly that, a wine spritzer. It combines wine with carbonated water to create a refreshing cocktail that Hungarians love to drink during the warmer days of the year. You can’t leave Budapest without trying a Hungarian sausage. One of the most popular types of Hungarian sausages is kolbász, a smoked sausage made traditionally with pork, garlic, pepper, caraway, and paprika. You can find it being sold in restaurants and by street food vendors, so you have no reason to miss the opportunity to try it. Aside from kolbász, you may also try hurka. 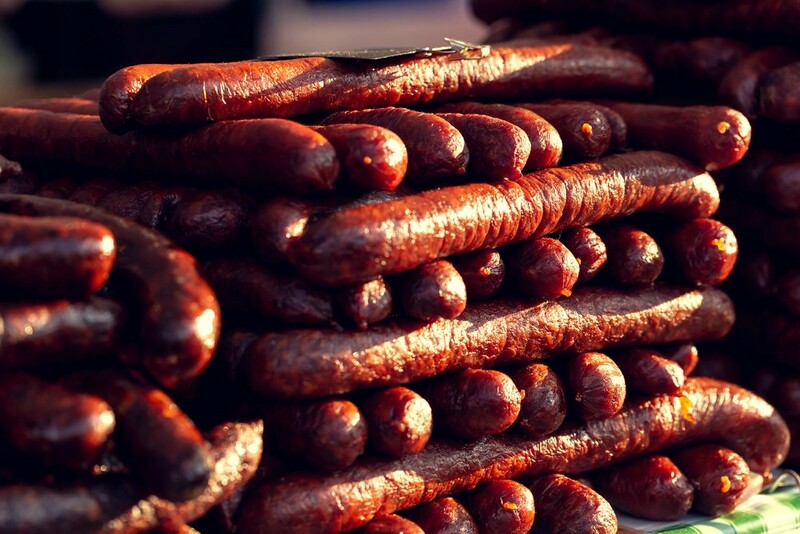 It comes in two main variations, the májas, which is liver sausage, and véres, which is blood sausage. Virsli (a long and thin sausage that resembles hotdogs), párizsi (a large and thick sausage that resembles bologna), and szalámi (Hungary’s version of salami) are also delicious sausages. A great place to same some is within Budapest’s Great Market Hall, which is packed with vendors selling local delicacies along with a with stands where you can buy some of the countries finest dishes, all under one roof. 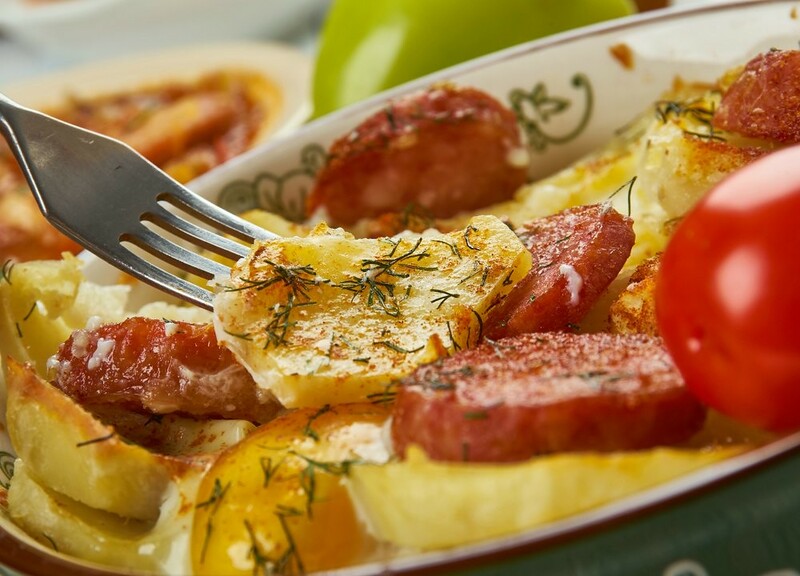 Rakott Krumpli is baked potato gratin that is made with potatoes, sour cream, sausages, and eggs. This casserole dish dates back to as early as the 1840s when Czifray István mentioned it in his cookbook, Magyar Nemzeti Szakácskönyve. 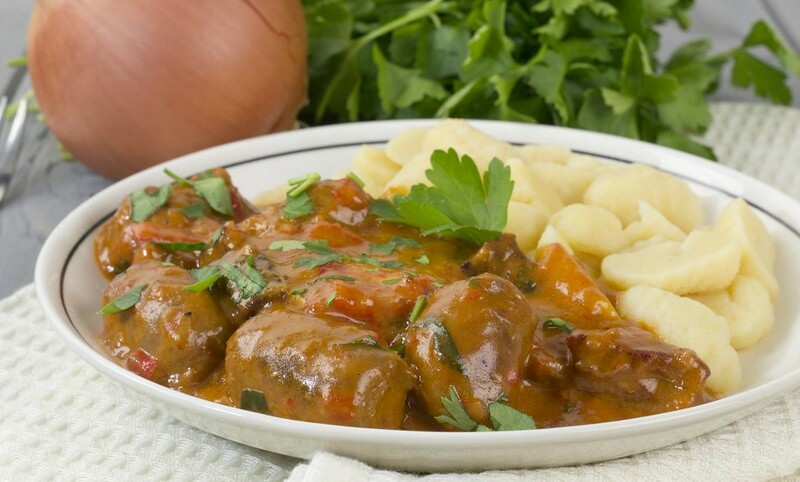 Rakott Krumpli is among Hungarian’s favorite comfort foods, almost as popular as their national dish, goulash. Luckily that makes it easy to find in Budapest as a regular menu item in most restaurants in the city. Pörkölts is another meat stew that originated from Hungary but is now served in many central and southeastern European countries. It is made with boneless meat, vegetables, or a combination of the two, and is seasoned with the Hungarian’s favorite spice, the paprika. In Hungarian, “pörkölt” actually means “roasted” so the dish is sometimes made with roasted meat. Pork, beef, and veal are typically used to create the stew, but other variations are made with chicken, liver, or tripe. The stew is slow cooked until the liquids are evaporated to create a concentrated rich thick flavorful gravy. While making the recipe can be time consuming, the results are well worth the effort. Túrógombóc is a light cottage cheese dumpling that’s typically eaten as a dessert or a snack. The dumplings are boiled and then rolled in toasted bread crumbs and often sprinkled with powdered sugar. As is true to many Hungarian traditional dishes, the dumplings are completed by serving them with a luscious sour cream sauce for dipping. Rétes, also called almás rétes, is Hungary’s version of an apple strudel. It’s made with flour, sour cream, eggs, baking powder, butter, water, tangy Granny Smith apples, cinnamon, sugar and and a little bit of vinegar. The addition of the acidic vinegar brightens the flavor, highlighting the fruit. While apple is the most popular filling, other sweet varieties include plum, poppy seed, cottage cheese, sour cherry, apricot, or a mixture of fruit. Savory varieties, such as chicken and potato, are also popular and definitely worth a try. 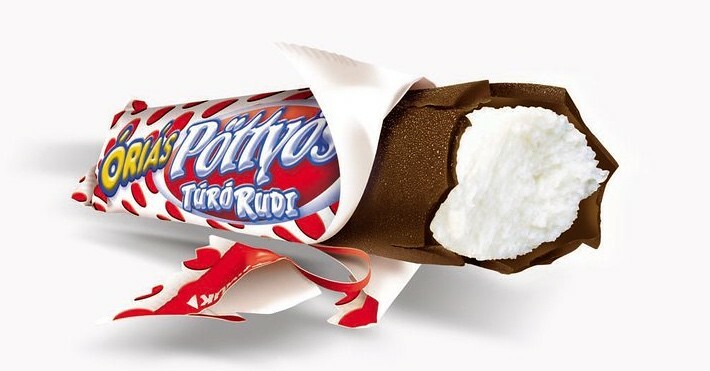 Túró Rudi is a chocolate and cream candy bar from the Hungarian brand Pöttyös made from cottage cheese. The name Túró Rudi actually translates to “curd bar” in English. It is an authentic Hungarian snack that appeared in the market in 1968 and still, to this day, is a popular treat. You can buy this delicious snack from most grocery stores in Budapest. It’s not sold in many countries, so this might be your only chance to have a taste of this sweet treat. Budapest is a beautiful place with a rich history and culinary traditions that make have placed it on the list of our favorite destinations. The simple fact that the end of Communist rule over Hungary ended in 1989 is intriguing in and of itself. Seeing the changes that have occurred in that short time, and hearing stories from those who have lived during the transition is eye-opening and inspiring. The changes can be seen in so many aspects of the country, including the food. While there we took several tours, including a Budapest food tour, ruin bar pub crawl, hike across the river up Gellert Hill, a Communism walk, a Budapest spa day, and finally a very fun and tasty cooking class. We recommend all doing all of it! Then go home, cook up a storm for your friends and family, and pass along the stories told to you during your stay. Beyond all of the amazing food, the many reasons to consider a visit to Budapest will be abundantly clear. It certainly won’t be a surprise to us if, after all of those experiences, Budapest also ends up on the top of your favorite destinations, exactly where it should be.